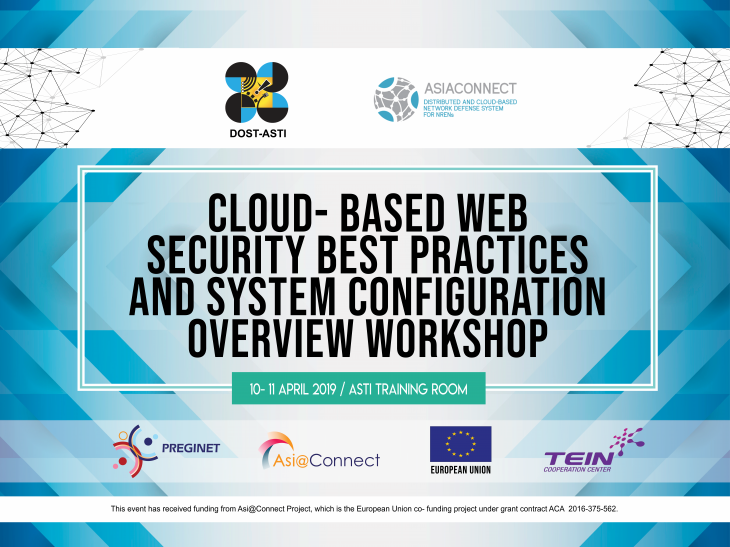 The Department of Science and Technology – Advanced Science and Technology Institute (DOST-ASTI), in partnership with Asi@Connect, will be hosting a stakeholders’ meeting and an overview workshop about the Cloud-based Web Security Best Practices and System Configuration on 10-11 April 2019 at the DOST-ASTI Office in Diliman, Quezon City. The two-day event, funded by TEIN* Cooperation Center and the European Union (EU), is being conducted as part of the Asi@Connect Distributed and Cloud-based Network Defense System for NRENs (DCNDS) Project. It aims to facilitate capacity building among network operations center (NOC) operators, network engineers, and security personnel that will support the effective operation of National Research and Education Networks (NRENs) in the Asian region. The event consists of a stakeholders’ meeting, which aims to bring together various members of the Information and Communications Technology (ICT) community that specializes in network security. The participants and speakers, particularly from the Philippine government, academe and international organizations, will discuss different topics and strategies in securing government and education networks due to the increasing threats and compromises in web security and distributed botnets. An open forum will also be held to share best practices among the attendees. Asi@Connect had also held similar events in Malaysia, Indonesia and Bangladesh. In the Philippines, PREGINET is the only NREN that interconnects and catalyzes research among academic, government and research institutions. ​It is being managed by the Solutions and Services Engineering Division in DOST-ASTI and a partner in the Asi@Connect Project. Through its local connectivity with government agencies and state universities, as well as its partnership with international RENs, PREGINET is able to interlink local and foreign content and applications. This benefits the user-communities in the areas of agriculture, bioinformatics, disaster mitigation, distance education, network technologies, and telemedicine. Aside from Asi@Conect, PREGINET also has linkages with international RENS including Asia-Pacific Advanced Network (APAN) and Asian Internet Interconnection Initiatives (AI3). The Asi@Connect Project provides regional high-capacity and high-quality internet network—the Trans-Eurasia Information Network (TEIN)--for research and education communities across Asia-Pacific and Europe. It is managed by the regional organization TEIN*Cooperation Center (TEIN*CC), which was endorsed by the ASEM-8 Summit in Brussels in 2010 and established in Seoul, Korea in 2011 with the aim of leveraging e-infrastructures developed for public service projects. Asi@Connect marks the 4th phase of EU funding to the TransEurasia Information Network (TEIN) program, which was launched as an Asia-Europe Meeting (ASEM) Initiative in 2000. It continues to connect regional researchers with their counterparts in Europe via GÉANT, the world’s most advanced international research and education network; thus, providing the Asia-Pacific countries with a gateway for global research collaboration. Its project partners include the National Research & Education Network associations (NRENs) of Afghanistan, Australia, Bangladesh, Bhutan, Cambodia, China, Hong Kong, India, Indonesia, Japan, South Korea, Laos, Malaysia, Mongolia, Myanmar, Nepal, New Zealand, Pakistan, The Philippines, Singapore, Sri Lanka, Chinese Taipei, Thailand, and Vietnam.